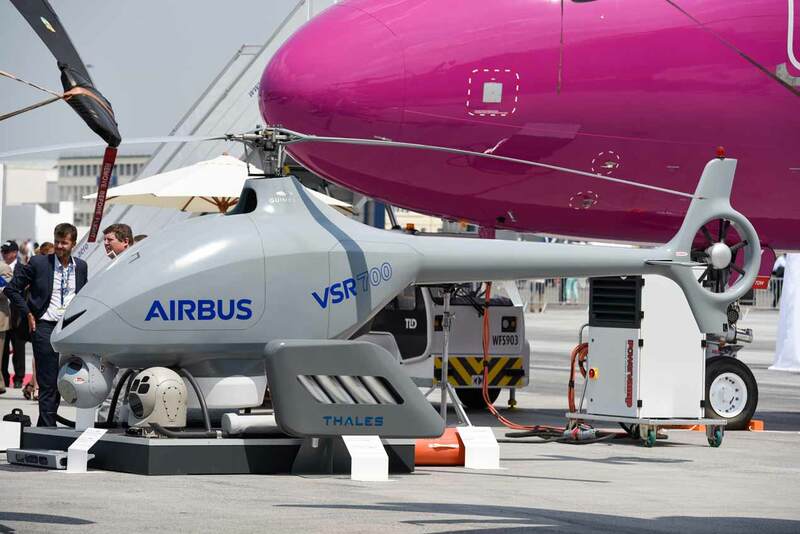 Airbus Helicopters’ VSR700 Optionally Piloted Vehicle (OPV), which was developed to meet navies’ requirements for a shipborne rotary-wing tactical unmanned aerial vehicle and as a complement to manned helicopters, made its first appearance at the Paris Air Show in Le Bourget this week. 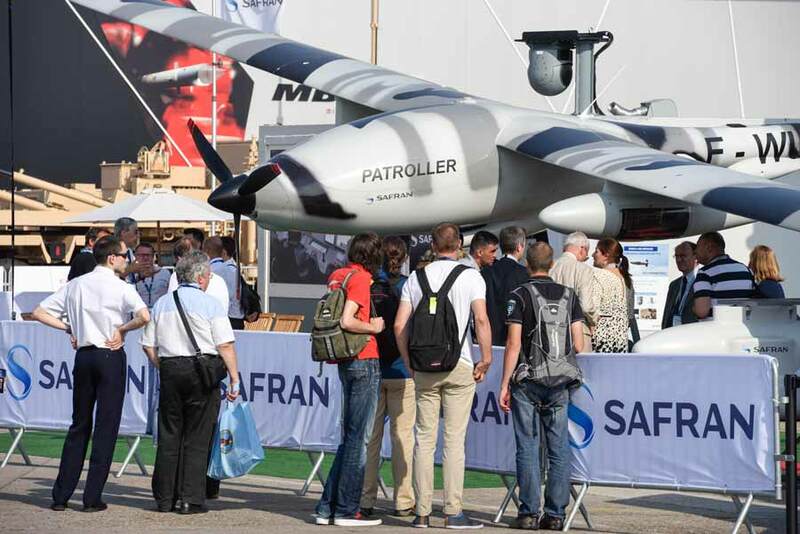 Safran's Patroller UAV, which won the competition for the French Army's new tactical UAV programme—it defeated Thales's Watchkeeper, which is used by the British Army—was also on display at Le Bourget in Paris this week. The multi-sensor tactical drone was designed for land forces, operational support and maritime surveillance. It can be fitted with a wide range of sensors, and is easily deployed in foreign theaters of operation. Using its own automatic launch system, it can be deployed from an airport without requiring any change to ground facilities, and can fly for 24-hours with a payload exceeding 250 kg (550 lb). The Patroller carries a new-generation very-high-resolution imaging system, and the ground station is interoperable with NATO control systems and networks. The first flight of an actual VSR700 prototype is expected in 2018. The first phase of flight trials with a safety pilot on board will focus on refining Airbus Helicopters’ automatic flight control system aboard the OPV, eventually leading to fully autonomous flights without a safety pilot. The VSR 700 flight control system is a fully-digital, multi-channel system with a high level of redundancy. It takes advantage of Airbus Helicopters unique expertise in digital autopilots. Sea trials of a manned Cabri G2 have also recently taken place with the support of a French Navy air defence frigate to assess the flight envelope of the VSR700 platform for shipborne operations. Regis Antomarchi, head of the VSR700 programme at Airbus Helicopters, says the trials will help mature the technologies associated to autonomous flight and confirm the suitability of the Cabri G2 platform for the VSR700, ahead of the first flight of the prototype next year. “Passing this first step of autonomous flights with a safety pilot on board allows us to validate the integration of Airbus Helicopters’ flight control system with the aerial vehicle and its specific engine installation” said Bruno Guimbal, president & CEO at Helicopteres Guimbal. The VSR700 can carry a wide array of mission equipment with a maximum capacity of up to 250 kg. Depending on the mission, its endurance could exceed 10 hours. In addition to being used by navies, the VSR700 could also be used in land-based military operations to carry out ISTAR (Intelligence Surveillance Target Acquisition and Reconnaissance) missions, thanks to its optical sensors and maritime/land radar. Airbus says the VSR700 will have a much lower operating cost than a helicopter thanks to its well-proven civil base vehicle and low-consumption diesel engine, as well as the fewer resources and less manpower required to operate and maintain it. In other news, Austrian company Schiebel announced that its rotary-wing UAS, the Camcopter S-100, recently successfully completed qualification flights on board the French amphibious assault ship, Dixmude. The flight trials are to confirm the Ship Helicopter Operating Limits and to qualify the Camcopter S-100’s integration onto the Dixmude. During the flight demonstrations, held in the Western Mediterranean, the Camcopter S-100 conducted around 30 take-offs and landings within a total of 15 flight hours during day and night. L3 Wescam’s MX-10 was used to transmit daylight and infrared data. Throughout the trials the system was operated independently by the French Navy CEPA/10s crew. The Camcopter S-100 can carriy a 75 lbs/34 kg payload for up to 10 hours and is powered with AVGas or JP-5 heavy fuel. It can also carry multiple sensors.